With historical sights galore, spectacular hiking, and traditional village atmosphere, Hasankeyf has far more to offer visitors than just its famous castle and bridge. Stick around after the tour buses zip off and your explorations will be richly rewarded. This mini-guide to the town and its surrounding area will get you started. You can get to Hasankeyf by flying to the Southeast Anatolian cities of Diyarbakır or Batman. Minibuses run regularly to Hasankeyf from both cities with the last bus leaving Batman at around 5 p.m. Travel time is approximately 2 to 2.5 hours from Diyarbakır (transiting through Batman) and 1 hour from Batman. 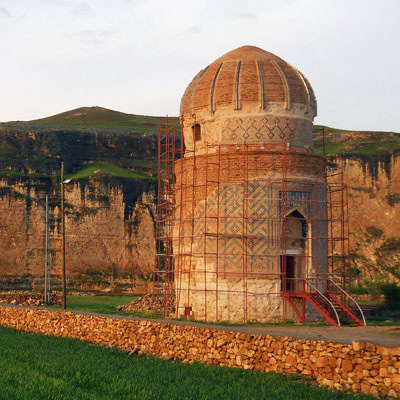 Most of Hasankeyf’s archaeological sights are free (other than the castle) and out of doors, but may or may not be accessible at any given time depending on the current state of repairs or the presence of a caretaker. Plan on a minimum of 24 hours in Hasankeyf to visit key monuments and do some hiking. A map and detailed listing of sites available at this link. For a printer-friendly version of A Walker's Guide to Hasankeyf (version 1.0) click here. Eski Köprü (Old Bridge) – The massive blocks of stone rising out of the Tigris River are the remnants of an early-12th-century bridge that was part of the Silk Road trading route. Zeynel Bey Türbesi (Tomb of Zeynel Bey) – This cylindrical tomb across the river from town dates to the 15th century and is dotted with rich blue tiles in a pattern characteristic of Central Asian architecture. Rızk Camii – Built in 1409 by an Ayyubid sultan, this medieval mosque near the base of the citadel is notable for the stone carvings on its minaret – and the stork’s nest perched on top. Süleymaniye Camii/Koç Camii – These two mosques, located in the center of town, are now largely in ruins but were among the city’s most important places of worship during the Artukid and Ayyubid periods. Baba Haydar Türbesi (Tomb of Baba Haydar) / Salihiyya Bahçeleri (Salihiyya Gardens) – This simple, blue-domed stone tomb is set amid peaceful walled gardens to the east of the city center. Cave dwellings – Some of the approximately 4,000 caves in the Hasankeyf area can be seen both within the castle precincts and in the cliffs surrounding the village on either side of the river. The caves above the footpath that continues south from the waterfalls above Salihiyya Gardens (toward the villages of Uzundere and Karaköy) are reasonably easy to reach and offer nice views of the canyon. Hiking – If you haven’t explored the vast, beautiful series of canyons and hills behind town and across the river, you haven’t really seen Hasankeyf. Check with local contacts for directions, restricted areas, and other tips. Castle/citadel – Dramatically set on a sheer cliff above town, Hasankeyf’s “castle” is a actually a complex of ruins dating as far back as the Byzantine era and including homes, forts, 14th-century palaces, and the Ulu Cami (Great Mosque). The Citadel was closed indefinitely in August 2012. The Nehir Lokantası and Antik Kent on the main road are good choices for cheap, hearty meals from breakfast onward. You’ll pay more to eat at one of the rickety restaurants overlooking the Tigris River, but the views can be spectacular. The Hasankeyf Hasbahçe also serves meals (including excellent fresh trout). With its tidy motel-style rooms and leafy garden, the Hasankeyf Hasbahçe is the best lodging option in town. Foreigners may be able to get permission to stay at the Hasankeyf Ögretmenevi (Teachers’ House) depending on availability. The Southeastern Anatolia Guide (Gaziantep Chamber of Commerce, 2007) has a better-than-average section on Hasankeyf, with four pages of information on its historical sites. 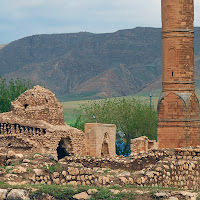 Travel writer Pat Yale wrote about a trip to Hasankeyf for Sunday's Zaman. 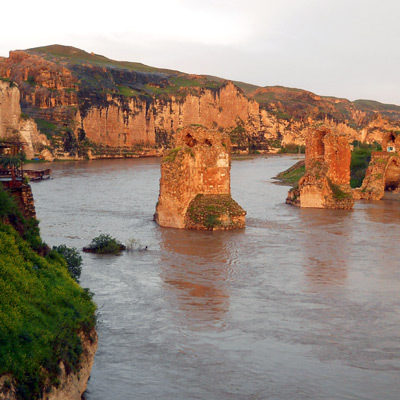 The European “Castles and Caves” website tells some of the myths and legends associated with Hasankeyf. Luis Dafos' photo essay captures the beauty of Hasankeyf and daily life in the town. Local resident Hüseyin Ağalday has written a brief guide (in Turkish) to the sites and folklore of Hasankeyf, Mağaralar Şehri Hasankeyf. Fırat Argun: Owner of Hasbahçe (+90 530 929 1527; hasankeyf_hasbahce@hotmail.com). Arif Ayhan: English-speaking merchant and tourism consultant. (+90 535 483 2328). Cemal Akbel: English-speaking adventure sports guide - rafting, kayaking, hiking (+90 536 917 7556, odakinternet@hotmail.com). Abdulkadir Can: Avid fisherman, hiker and reliable guide; limited English (+90 542 240 6795). İdris Kartal: English-speaking guide. Phone or email in advance (+90 537 769 2333; souloftigris@hotmail.com). Doğa Derneği (Nature Association): The organization, managed locally by Derya Engin, generally has volunteers in the village and a storefront office amidst the touristic shops on the main market street. Hasankeyf'i Yaşatma Girişimi (Save Hasankeyf Initiative): This group also has an office in the tourist market. Ömer Güzel: Owner of Güzel Mini Market on the high street. A great source of local information and a key volunteer leader (+90 533 397 3657). "Çoban" Ali: One-time shepherd and popular singer in the village (+90 546 482 2016, +90 536 346 3022; aliayhan838@hotmail.com). Doğa Derneği Hasankeyf Ofisi, Derya Engin, Eski Çarşı, Hasankeyf.